CD-adapco Senior VP of Product Management Jean-Claude Ercolanelli addresses the audience during STAR Global Conference 2016 in Prague. Over 600 attendees were on hand for the three-day global event that provided attendees with the latest developments in engineering simulation. CD-adapco, a global provider of multidisciplinary engineering simulation and design exploration software, recently held its STAR Global Conference 2016 before a sold out, standing-room only audience in Prague, Czech Republic. Over 600 attendees were on hand for the three-day global event that provided attendees with the latest developments in engineering simulation. Presenters showed real world examples on how the technology is being deployed to solve industrial problems, reduce costs and empower innovation on a global scale. 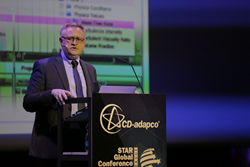 In addition, product specialists from CD-adapco revealed how they continue to set the bar for the requirements of today’s engineering simulation tools, as they unveiled their roadmap for STAR-CCM+® v11, the company’s industry-leading engineering simulation solution. The theme of this year’s conference was, “Discover Better Designs. Faster.” Some of the biggest names in engineering gathered from across the globe. Abbott Diagnostic, Airbus Operations GmbH, AREVA GmbH, BAE Systems Maritime - Submarines, BASF SE, BMW, Bottero Glass Technology, Caterpillar, Daimler, Dyson, Ford Motor Company, Hyperloop Technologies, Mercedes-Benz, Porsche, UTC Aerospace Systems, and Volvo, were among the 100-plus companies who presented. Many of these presentations are available from the conference minisite. STAR Global Conference 2016 was the official release event for STAR-CCM+® v11. This year’s releases of the product will deliver new modeling capabilities and bring productivity and usability enhancements that will forward the company’s mission to help customers discover better designs, faster. The first release of 2016, v11.02 introduces Data Focus, a unique visualization technique that explores and interrogates results interactively. Find more details on the company blog and news section. Martin Whitmarsh, CEO of Land Rover BAR, was the Keynote Speaker. The former CEO of McLaren F1 discussed how the innovation that simulation offers can answer engineering challenges and secure victory in the quest to bring the America’s Cup back to England. CD-adapco (http://www.cd-adapco.com) is a global engineering simulation company with a unique vision for Multidisciplinary Design eXploration (MDX). Engineering simulation provides the most reliable flow of information into the design process, which drives innovation and lowers product development costs. CD-adapco simulation tools, led by the flagship product STAR-CCM+®, allow customers to discover better designs, faster. The company’s solutions cover a wide range of engineering disciplines including Computational Fluid Dynamics (CFD), Computational Solid Mechanics (CSM), heat transfer, particle dynamics, reacting flow, electrochemistry, acoustics and rheology. On average, CD-adapco increased its revenue at constant currencies by more than 12 percent annually over the past three fiscal years. CD-adapco employs over 900 talented individuals, working at 40 strategic locations across the globe.